Sarah Hulett tags along with a demolition crew in Detroit. Detroit is in the middle of one of the most ambitious demolition campaigns the nation has ever seen, tearing down about 200 houses every week. Many of the homes being razed are in neighborhoods where people still live. So Detroit officials sat down before the blitz to come up with some new regulations designed to keep people safe from dust, and from hazardous materials that could be in that dust – like lead, or asbestos. New rules require demolition contractors in Detroit to do things like cover loads of debris. And field liaisons check on sites to make sure they're following the rules. And that right there – a public health expert helping write rules for tearing down homes – is at the heart of what Detroit is doing differently. On a recent day on Heyden Street, in northwest Detroit, crews are taking down three homes. But a lot of work was done before getting to this point. Neighbors got a heads up that the crews would be coming. That’s something that didn’t used to happen regularly. There are now field liaisons checking to make sure the contractors are following the rules, and fielding questions or complaints from neighbors. The people working on the demolitions are all required to wear bright green vests to ID them, with a phone number on the back that residents can call to get questions answered, or to report any problems. Another new mandate is that crews have to spray down the houses as they’re coming down. 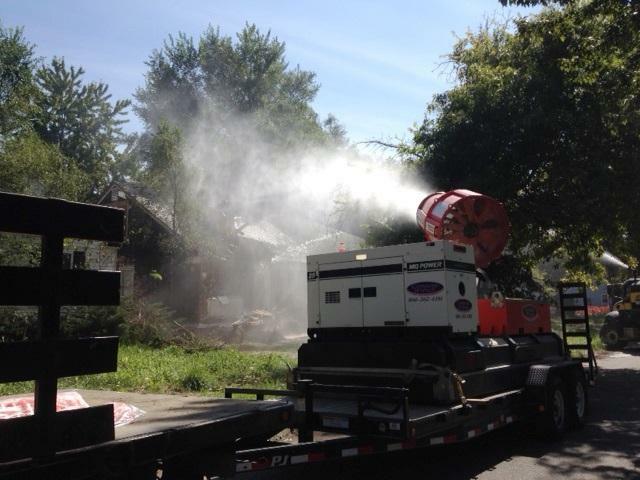 "The dustbuster" keeps the demolition site sprayed with a mist of water to cut down on dust, which could contain hazardous materials like lead. The point of the water is to keep the dust down. There’s a lot of respiratory disease in Detroit – asthma among kids – and the dust could contain lead. That carries a whole other set of problems for children, ranging from learning disabilities and behavior problems to kidney damage. City officials say the unprecedented scale of Detroit’s blight problem demanded a different approach. A report in May put the number of blighted buildings in Detroit at more than 40,000. And it said there’s another 38,000 vacant or foreclosed homes. City officials worked with the EPA and state regulators to develop the new standards. Detroit Building Authority Director David Manardo said it’s not clear yet how much cost these extra regulations add, but he added that even if it is marginally more expensive, it’s a good deal if it avoids problems in the long run. “Advising residents on demolition activity can help them take steps to reduce their exposure to contaminants or dust,” said the EPA. “Detroit’s new demolition practices now balance speed, cost, and environmental performance. These practices may be applicable to other communities." On Seneca Street on Detroit’s east side, Olivia Johnson watched an excavator scoop up piles of debris from the house that used to stand next door to hers. She said she was glad when she found out the house would be razed, but she did have some concerns. Johnson watched as a large truck was loaded up with debris. The city’s new rules require that the loads get covered. That’s another safeguard against contaminated dust floating through the neighborhood. MCM Management Corp. - 'City of Detroit Buildings Demolition' Project 2014 from MCM Industrial Services on Vimeo.